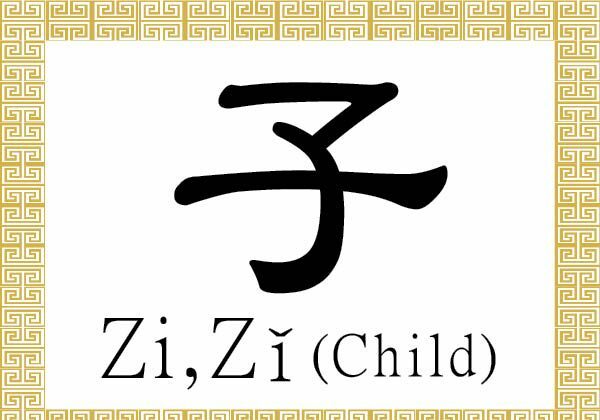 The Chinese character 子 (zi, zǐ) refers to a son, a boy, a child, a person, or a seed. 子 (zi, zǐ) is a pictograph that depicts a baby swaddled with the arms out. With the body snugly and cozily wrapped in a blanket, the infant’s head stands out as a prominent feature of the image. In early versions of the character, the way the two arms were drawn conveyed a sense of up-and-down motion, denoting the lively spirit of a young child. Some examples of terms that use 子 (zi, zǐ) include 孩子 (hái zi), a child or baby; 子女 (zǐ nǚ), sons and daughters; 孫子 (sūn zi), a grandchild; 子孫 (zǐ sūn), offspring or descendants; 女子 (nǚ zǐ), a woman; 男子 (nán zǐ), a man; and 弟子 (dì zǐ), a disciple. 君子 (jūn zǐ), often translated as “gentleman,” refers to a person of noble character. 種子 (zhǒng zi) or 子實 (zǐ shí) is a seed, and 核子 (hé zi) means a nucleus or something nuclear-related. In scientific discussion, a molecule is called 分子 (fēn zǐ) in Chinese, an atom is called 原子 (yuán zǐ), the nucleus is called 原子核 (yuán zǐ hé), and the three particles that make up an atom are called 質子 (zhí zǐ), proton; 中子 (zhōng zǐ), neutron; and 電子 (diàn zǐ), electron. Midnight is called 子夜 (zǐ yè), while 子時 (zǐ shí) refers to the time period from 11 p.m. to 1 a.m.
子 (zi, zǐ) is also used as a title denoting a great teacher or highly respected master, such as the ancient Chinese philosophers 老子 (lǎo zǐ), Laozi; 孔子 (kǒng zǐ), Confucius; 孟子 (mèng zǐ), Mencius, or Mengzi, the second sage of Confucius doctrine; and 莊子 (zhuāng zǐ), Zhuangzi, the major patriarch of Daoism after Laozi. The idiom 父慈子孝 (fù cí zi xiào) describes parents who are loving and kind (慈, cí), and children who demonstrate filial piety (孝, xiào). 父 (fù) is the character for father but indicates both parents in this idiom. Filial piety refers to the attitude and duty of respect, care, and obedience toward one’s parents, elderly family members, and ancestors. It is considered the most fundamental virtue in Confucian philosophy and the basis of morality and proper human relations. The idiom 赤子之心 (chì zǐ zhī xīn) describes someone who is very sincere, with a heart (心, xīn) as pure and innocent as that of a newborn infant (赤子, chì zǐ). The phrase 君子之交淡如水 (jūn zǐ zhī jiāo dàn rú shuǐ) states that the friendship between persons of noble character (君子, jūn zǐ) is as plain and ordinary as water (水, shuǐ). It depicts a genuine and enduring friendship between two people who both have the wisdom and strength of character to be able to maintain a heart as clean and calm as water regardless of what they encounter. The Chinese character for old also refers to being venerable, skilled, expert, or experienced.